Burkina Faso's President Roch Marc Christian Kabore, left, is welcomed by French President Emmanuel Macron at the Elysee Palace in Paris, France, Dec. 17, 2018. France agreed Monday to a new military framework with Burkina Faso that would speed engagement of its forces to fight Islamist militants in a northern border region of Burkina where there has been a spike in violence. The arid Sahel region is suffering violence from militant groups linked to al-Qaida and Islamic State, highlighting the difficulty international partners face in restoring regional stability. The northern region of Burkina Faso, bordering Mali and Niger, has been especially hard hit, leaving the fragile West African state struggling to assert its authority since ex-Burkinabe president Blaise Compaore was ousted in 2014 at the hands of a popular uprising. "There will be no extra [troop] involvement on the French side," President Emmanuel Macron said at a news conference with Burkinabe counterpart Roch Marc Christian Kabore in Paris. FILE - French soldiers from Operation Barkhane patrol north of Timbuktu, Nov. 6, 2014. However, he said Paris was ready to send more trainers and military advisers as well as extra equipment. Paris will provide the local army with 34 pickup trucks. France, the former colonial power in the region, intervened in Mali in 2013 to drive out Islamist militants who had occupied the north, and has since kept about 4,500 troops in the region as part of Barkhane counterterrorism operations. 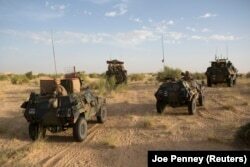 It has between 250 and 400 special forces based in Burkina. Led by France, Western powers have provided funding to a regional force made up of soldiers from Mali, Niger, Burkina Faso, Chad and Mauritania to combat jihadists. But the so-called G5 force has been hobbled by delays in disbursing the money and poor coordination between the five countries while insecurity has escalated.